everyone has a place that they've been wanting to try for a while. mine was tavernita, a small-plates-centric restaurant located in river north ... at the corner of erie & lasalle. 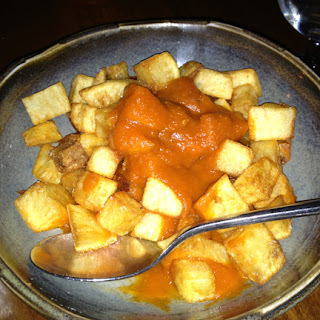 tavernita "offers a mix of american dishes, using influences from france, italy & spain." sounds pretty much like perfection. they also feature "an innovative beverage program, showcasing creative selections from around the world." the about section notes that it's a menu that is "designed to encourage sampling & sharing." this sometimes makes a vegan nervous ... as there are not always a lot of vegan items to go around. but that was definitely not the case at tavernita. so so so many easily convertible vegan options. 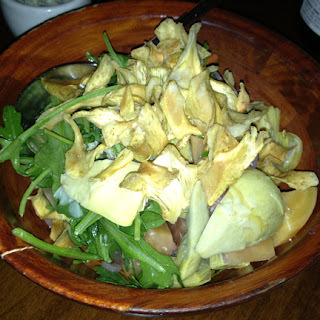 artichoke, arugula & artichoke chips. 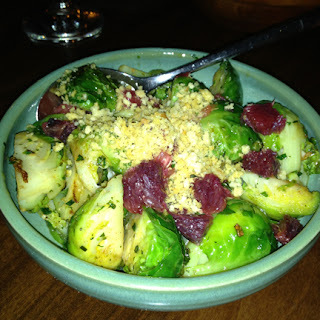 um, all delicious, fresh ingredients topped w/ artichoke chips (amazing, i had never had before). kind of salad perfection. i'd love to eat this pretty much every day. it regularly comes with bleu cheese, which can be omitted or put on the side for non-vegan dining partners. 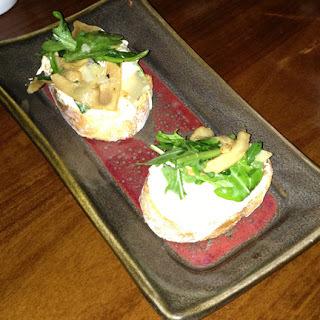 this was reminiscent of the ceci bean bruschetta from la madia, but sadly - not quite as good. the picture is terrible (sorry, amateur iphone photographer), so you can't see that it's basically hummus on crostini. still, a great & tasty vegan option. again, cheese on the side. blood orange & salsa verde. yum. everyone at the table loved these. they were fresh, (almost) all perfectly cooked & super flavorful. and the blood orange added just the right amount of sweet. meat bits omitted. these definitely brought me & my girlfriends back to our days in spain. the sauce had a nice little kick to it, but wasn't overwhelming. and the pots were perfectly crispy. fried egg on the side. all in all, i loved tavernita. and i will definitely go back. one thing i must note is how awesome our server was. she knew exactly what could or couldn't be prepared vegan off the top of her head. (including that one of the salad dressings had some egg whites in it ... tiny fact! much appreciated!) ... there were (i think) two other items that i could have had, as well. it's not like i even exhausted the menu! so vegans - if you're looking for a lively dinner spot, look into tavernita. you won't be disappointed.